Annual World's Largest Garage Sale will have Duncan, The Heart of The Chisholm Trail, full of treasures waiting to be discovered this coming weekend. World's Largest Garage Sale, a tradition now in it's 31st year, will have Duncan abuzz with deals galore July 15 and 16th, 2016. Garage salers! Elvis alert! 7th & Main St.
An annual tradition in Duncan now in its 31st year, World's Largest Garage Sale is a true community wide event with multiple sales happening in all of Duncan's residential neighborhoods and sidewalk sales happening in all retail areas of the city. Although the Duncan Chamber of Commerce's SummerFest no longer occurs remember to visit Fuqua Park and see all things train related at the 905 Train Depot and Museum, the new interactive Rhythm and Routes Exhibit at the Stephens County Historical Museum celebrating Hoyt and Mae Axton and, of course, enjoy the rides at Kiwanis' Kiddieland all weekend long. Visitors will find residential sales beginning as early as Thursday, with the majority of all sales being held on the Friday and Saturday. Hours will vary by location. Garage sale enthusiasts will find an insert in the Thursday and Friday editions of the Duncan Banner and the Chisholm Trail Shopper the week of the sale. Retailers at Elk Plaza Center will have side walk sales outside and hot deals inside as well. Shoppers may also visit inside the Chisholm Mall, with retailers and vendors there from 10:00 AM to 5:00 PM. While in Duncan, garage sale visitors should take the time to see the four Bob Palmer murals scattered around the city and check out the most recent, a tribute to the Oklahoma Music Trail that celebrates Duncan's own Hoyt Axton and his mother, Mae Boren Axton. 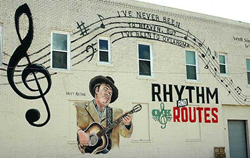 The Rhythm and Routes mural can be seen at the corner of 7th and Main Street on the east side of the historic Henderson building. And no visit would be complete without stopping in to say howdy at the Chisholm Trail Heritage Center. This annual tradition continues to grow year after year, with the community's population increasing by 8,000 to 10,000 people over the course of the weekend. World's Largest Garage Sale is certain to have a treasure or three waiting to be found and Duncan's hospitality will make you come to visit again. For general information please contact the Duncan Convention and Visitors Bureau at 1-800-782-7167 or http://www.visitduncan.org.